It is mid-December as I type this, and I am currently 49 books into my 50 books reading goal for the year (this count does not include rereads, picture books, or early readers). I’m smack dab in the middle of Winter by Marissa Meyer and will be picking up Frozen Tides by Morgan Rhodes as soon as I can get my hands on a copy. And with several days off of work for the upcoming holidays, I am fairly confident that I will reach, and possibly surpass, my 50 book goal for the year. 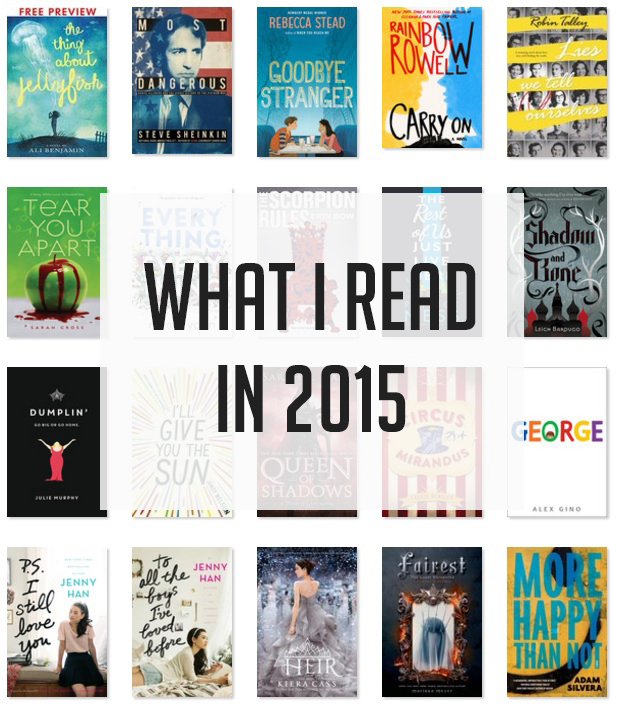 2015 was a FANTASTIC reading year for me! I can’t even tell you how many times I found myself so completely absorbed in a book that I lost track of time and space and sorta forgot who I was for a bit. This usually doesn’t happen to me very often, but there was just something about this year. Maybe it was a good year for books in general. Or maybe I’m just getting better at finding stuff that I like. Or maybe the planets and stars just aligned in such a way that all Tauruses had a good reading year. I don’t know. But I do know that I had so many feels about so many books, that I just have to talk about them. So here’s an end of year reading survey. Be careful; it’s long. Throne of Glass by Sarah J. 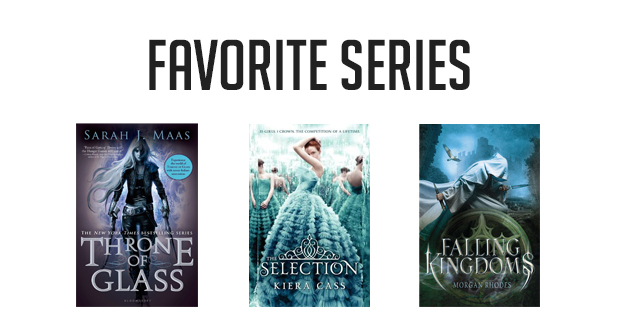 Mass — I discovered this series through a lot of fangirling on the YA book blogs that I read. It sounded interesting enough, so I settled down in my reading chair at the end of January while a blizzard roared on outside, and I became completely captivated with this world. Throne of Glass is about a teenage assassin who is hired by the crown prince and captain of the guard to compete in a tournament to become the king’s champion. It is set in a world in which magic is outlawed and an evil king is conquering the countries that border his already expansive kingdom. There is, of course, much more to it than that, but that’s the basic premise. I couldn’t put down the first book and loved the second book up until the end when a certain plot twist (that had been hinted at throughout the series) was revealed. Even though I had warning, I hated that plot twist — to the point where I had to call up a librarian friend on Skype to emphatically complain about it and gesticulate madly (watch out for my limbs; they can be dangerous when I’m upset). Despite being peeved over the plot twist, I picked up the third book, and while it took me awhile to get into it, I began to love the series again. The fourth book, Queen of Shadows, is my favorite in the series, and it’s the book that made me LOVE EVERY SINGLE CHARACTER, OMG! If you’re looking for a fun fantasy romp, I highly suggest this series. The Selection by Kiera Cass — I picked this one up because there were so many girls requesting it at the library that I just had to see what all the hype was about for myself. I consider this one a good guilty pleasure read. I honestly can’t tell you exactly what it is that makes me love it so much. It’s probably a combination of the writing style and the characters and the setting and the fact that there’s action but not too much action. Whatever it is, I inhaled each book. Falling Kingdoms by Morgan Rhodes — I hadn’t heard a thing about this series until I saw a display for it in Barnes and Noble. The fact that a big store was very actively pushing it when I hadn’t heard so much a peep about it made me curious enough to try it out. This one was a bit more of a slower read for me. All throughout the first book, I was liking it just enough to keep going, but not enough for me to really gush about it. And then it ended…and there was something about the final scene that just made me NEED the next book. This is another book that features greedy kings and a world in which magic is gone (but instead of being outlawed, it’s just weakened to the point of near nonexistence). While I don’t love the characters as much as I do in the Throne of Glass world, Falling Kingdoms has a very intense OTP. Simon vs. The Homo Sapiens Agenda by Becky Albertalli — This was such a cute, contemporary high school story! It’s about a not-so-openly gay teenage boy who has to navigate the treacherous waters of high school while playing wingman to a classmate to keep some flirtatious e-mails a secret. The e-mails between Simon and Blue are adorable, and Simon’s group of friends are interesting and realistic. I spent so much time during the book trying to figure out who Blue is, and I’m happy with his reveal. Overall, a great, light read! Made You Up by Francesca Zappia — There was a lot of books about mental illness (and illnesses in general) this year! While I read several of these books throughout the year, Made You Up is, by far, my favorite. It’s about a girl who’s living with schizophrenia and therefore cannot tell between reality and her hallucinations (hello, unreliable narrator!). While the book and the topic of schizophrenia are presented seriously, there’s a lot of lighthearted moments to this book. There’s also a really sweet relationship between the main character and a boy who has a few problems of his own. Also…LOOK AT THAT COVER!!! I kind of want to frame that cover. I’ll Give You the Sun by Jandy Nelson — This one had a lot of hype in 2014, but I didn’t get around to reading it until this year. There is just so much to love about this book: the relationship between the siblings, the art, the way the story was told! This is one of those books where I wish I could forget every single thing about it and reread it for the first time all over again. Love, love, LOVE this book! Everything, Everything by Nicola Yoon — This is a story about a girl who is allergic to everything and therefore lives a very sheltered life within her own home in which her only visitors are her mother, nurse, and the occasional tutor. But then a boy comes into the picture and her her world expands to include everything. The writing for this book is superb, and I especially love the drawings that are included! To All the Boys I’ve Loved Before by Jenny Han — I don’t know why I didn’t pick this book up sooner, but for some reason, I just wasn’t interested. I was fairly certain that I wouldn’t like it. I decided to give it a chance simply because it seemed like a lot of people were raving about it. So I picked it up and absolutely loved it! What I loved best about it was the family. I kind of just wanted to crawl into the book and be a part of that family (even though I love my actual family very much). The Scorpion Rules by Erin Bow — I…hated this book? Hate might be a strong word, but I really didn’t like it and was so disappointed because the premise — countries have to send their heirs as hostages to be killed if the country ever goes to war — is one of the most creative and interesting premises I have ever heard. But the main character is just…so…boring! She’s treated as a ~special~ snowflake, though I have no idea why. Every other character is more interesting than her, but we don’t learn much about them because this book is dull and focuses on ~special snowflake girl~ and while there should be action and intrigue, there’s just a bunch of GOAT FARMING!!! LIKE, ENOUGH WITH THE GOATS ALREADY! Did not like at all. Red Queen by Victoria Aveyard — This book got a lot of hype this year, and…it was okay? I didn’t hate it, but I didn’t love it either. I really have nothing to say about this one other than I probably won’t be reading any sequels. All the Bright Places by Jennifer Niven — This is another book that got a lot of hype this year, and I do agree that it’s a good book. But the character, Finch, reminded me of some people from my past and that, in turn, kind of made me not like this book. Once Upon a Crime Family Series by Tiffany Schmidt — This series has such an interesting concept — fairy tale retelling with crime families! Hold Me Like a Breath was wonderful, and the next one in the series, Break Me Like a Promise, is due out in June 2016. Will keep my eye out for it! Court of Thorns and Roses Series by Sarah J. Maas — I almost put this one in the disappointment section because reading this book almost felt like reading Throne of Glass with a different setting and a few tweaks and changes. But, ultimately, I’m not too disappointed because I still kind of enjoyed the book? And I still kind of liked the characters? And the end leaves you hanging for the next one in the series. Which is due out in May of 2016. This is a cool idea for a post! I really enjoyed All the Bright Places, but I fully understand your reasoning for not liking it. Sometimes little things from our pasts can make present things turn sour for us. However, I do agree with a lot of the book you mentioned! I haven’t read Made You Up, but now I really want to.